I know I wasn't keeping logs for a while, it was because I was trying to gather a new team. I am at Jameson Memorial right now, looking at the luxury liner one last time, before I go to sleep. I used to cruise with one of these before. When I look at it I remember the times back, with all the goods and sad stories. Anyway; I found a programmer today and managed to sync the ships logs with the Spartan. So when I enter a log from this remote handheld console, it will be synced to the spartans logs. 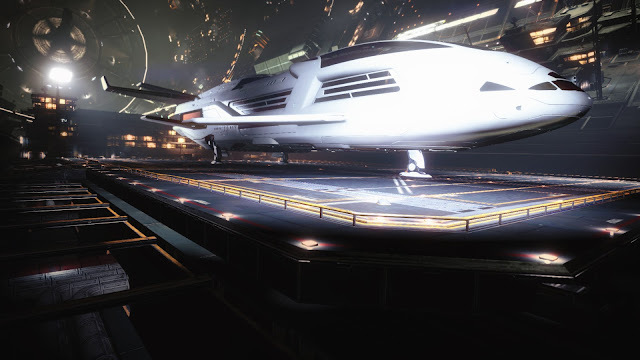 Why a luxury liner instead of the spartan? Well.. I made some insanely rich friends at Cubeo from higher strata. Some of them were amazed by my stories in the black and they want to see it by their own eyes. There are also some scientists among them who wants to experience the space instead of lecturing in the imperial academy. Most of them didn't even leave their home system before, and they are so used to their luxury homes and environment. Actually they paid the ship from their own pockets for their needs. I will be the guide and the captain. By the way it is like a shopping fest in here. Everything including all ships and modules are at least 10% discount in the station. Pilots are crazy in here, trying every ship and every possibility. They have everything ever manufactured in the station. If I need something I will definately buy it here from now on. Security is a bit tight though. Maybe it is because the Aisling branding on the ship. They don't like us up here very much, but the discounts are for everyone. Going to my room now, our trip will start tomorrow from Cubeo. Oh, it will be called Eternal Eden. Permits and licences will be ready in the morning.